As you’d expect this review only includes thoughts and information about cider and perry at this years event. Demand for real cider and perry continues to increase with new cider makers starting up throughout the UK every year – this was evident at GBBF last week with a fantastic selection of traditional west country and eastern counties ciders available at Earls Court, London. 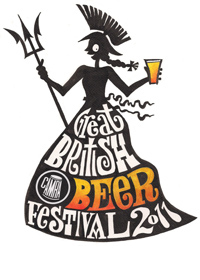 CAMRA‘s annual early-August event celebrates British drinking. With over 110 ciders and perries at the Great British Beer Festival this week, CAMRA showcased the largest selection of real cider and perry ever seen at the event. The range included award winning ciders and perries from national gold medallists at the National Cider and Perry Championships, judged at the Reading Beer Festival earlier in May, including Virtual Orchard cider. Gwynt y Draig, Two Trees perry and Black Dragon cider were among the three fastest selling drinks in the first three days of the Festival. Great news for Welsh cider makers. Catch them at this weekends International Cider Festival. 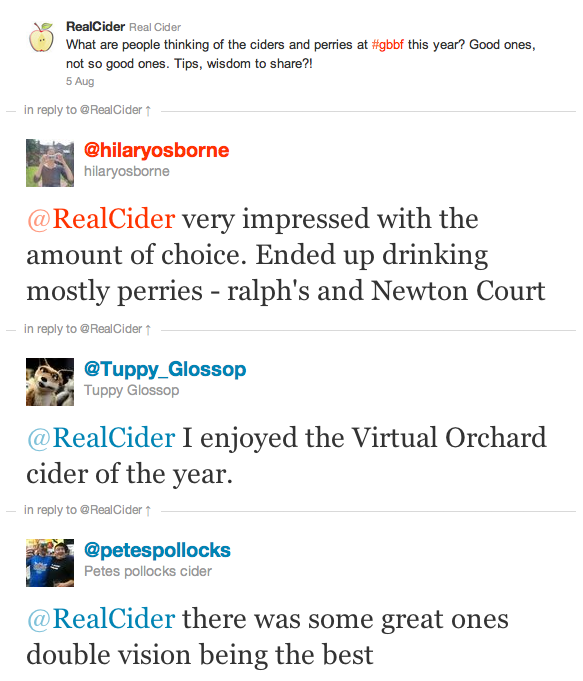 We also had a good response of ‘cider heads’ live tweeting their responses back to us on Twitter. As an added bonus this year, I had the pleasure of doing cider bar training with CAMRA’s Mick Lewis (chief cider head). Mick guided us through what he defines as real cider and perry, following CAMRA’s guidelines. The group was made up of 10 people who were either starting to make their own cider, sell it at a cider event, or learn more about what makes a good cider. The interesting aspect for me was the cider tasting, of course! where Mick explained you didn’t have to like them all, just appreciate the difference in the tastes by there location in the UK, and style of fermentation. We tasted around 12 ciders from all corners of cider land. One aspect where the cider and perry selection should be applauded is supporting first time ciders at events. A great way of enjoying British apples all under one roof! Finally, here are some personal images of the event. Hope you enjoy. If you did make it this year let us know what you thought by leaving your comments below. 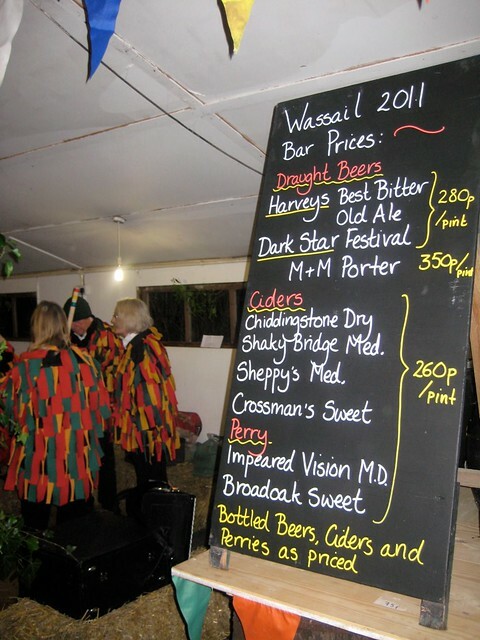 If you didn’t – hope to see you at the cider bar next year! It certainly doesn’t need to be said that “all cider” events are pretty rare here in the US. However consider an event where the overwhelming percentage of bottles poured and kegs tapped are from craft cider makers. Well it finally happened in Seattle last Saturday! Cider Summit N.W. was also the inaugural event for the Northwest Cider Association of which many of the names above are members or on their way to becoming members. The Cider Summit N.W. boasted some 40+ craft ciders and they delivered. In attendance from the NW craft cider ranks were Blue Mountain Cider Company, Carlton Cyderworks, Eaglemount Cider, Finnriver Farm & Cidery, Red Barn Cider, Snowdrift Cider Co., Tieton Cider Works Vashon Winery/Irvines Vintage cider, Wandering Aengus Ciderworks, Westcott Bay Cider, and Wildfire Cider. We even had an extra special visit from my favorite BC cider maker Sea Cider. Visitors from abroad included Dupont & Drouin from France, and from England Aspall and Samuel Smith. I’d really love to see true English cider representation increased on the market and at the event. The highlights? Where to begin and too many to list. I’ve had the pleasure of drinking most of the ciders there and if I were to only name the highlights it might misrepresent the amount and quality of the craft ciders present. My favorite cluster of booths just happen to house my favorite regularly available cider selections. Snowdrift Cider Co., Tieton Cider Works, Wandering Aengus, Westcott Bay Cider, and Wildfire Cider. More great NW Cider events on the way. Check out Vashon Island’s Cider Fest October 9th, Portland Nursery’s Artisan Cider Festival October 9th-10th and 16-17th, and Ivar’s Salmon House 3rd Annual Fall Cider Celebration coming in November. A film made up of over 8,000 photographs shot during the 3 day Ross-on-Wye Cider Festival. A selection of our most favourite photographs of the week. 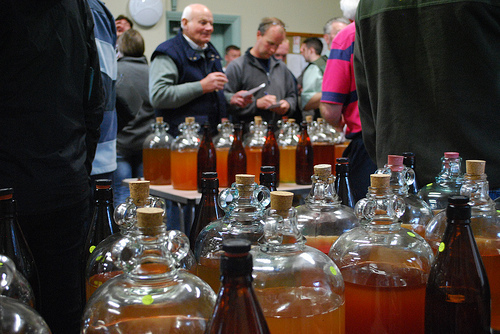 View this years Cider and Perry winners at the Show.